The perfectly unlikely night-and-day all-weather base layer. It came in a white UPS envelope made in part from recycled plastic. Not a moment too soon. It was rolled and bundled with a short length of twine. There was no packaging, per se. Just a tag with a note on aspirations and a simple warranty spelled out in soy ink on 100% post-consumer waste, safety-pinned to the cloth. The gist: if you don’t love it, send it back. Something about it evoked for me an old coveted pajama top. Perhaps it was the softness of the cotton—two layers of it, woven in India. Or perhaps it was the boldness of the plaid. And why not? I’m more likely to sleep in a good button-down than I am to dress it up with a cravat and take it out to a formal dinner. It fit like it seemed it should, even over a T-shirt. The tails fell well below my belt, front and back. The sleeves came all the way to the base of my palms, even with my arms outstretched. I threw over it a down jacket and a shell, heaved on my pack, and headed out for a long weekend in what’s left of the wide-open west. A week later, I’m still in the same shirt. I’m in the trailer down in the Owens Valley, propped up on a pile of pillows and scribbling in my notebook. The boys are out running and playing on the dormant grass, in the half sun. I can hear the wind rattling in the bony winter cottonwoods. Out the window, I can see across a vast sagebrush moraine to the west flank of the Inyos salted with snow. The author captured in a rare moment of respite. Shirt by prAna. Over seven days, I’ve put this thing through rigorous and extensive testing. I’ve worn it to the grocery store. I’ve worn it in the backcountry. I’ve worn it against my skin, in the sunshine and the wind and under Orion at the frosty edge of midnight. I’ve worn it at 11,000 feet and at 4,000. I’ve slept in it. I’ve had the day’s first cup of coffee in it. And the second and third. I’ve had expensive cocktails in it. And I’ve worn it beneath three layers on the way to the outhouse at dawn. I’ve used it to clean my sunglasses, to wipe my brow, to dry my feet, and to lift a pot of bubbling stew from a wood stove. I’ve washed it in warm water and hung it up to dry. (If it gets into the drier I fear it’ll no longer fit so well.) I’ve worn it with a swimsuit and sandals to and from the hot springs. I’ve hiked in it and skied in it and even handed my expired driver’s license to a somewhat skeptical salesman and test-driven new cars in it. And there I was just this morning, pedaling down an empty road in it, not far behind my older son. There was a certain ferocity to his efforts. But there was also ease. There was power and control. I could see that for the first time in his almost six years, he not only felt and appreciated the sheer pleasure of cruising on a bicycle—the simple freedom of it—but that he’d also begun to glimpse the range of possibilities to come. And then he took a surprise short cut across the grass, leapt over a bridge, and beat me back to camp. So far so good, I think. I won’t be sending this one back. Check out BETA Editor-in-chief David Page field-testing various gear including prAna. Read Associate Editor Michelle Schusterman’s prAna Monarch Convertible Pants for Women review. MatadorTV’s Joshywashington goes horseback riding and more in prAna Stretch Zion Pants for Men in Argentina. Want to win some prAna pants? How about $500 worth of prAna gear? 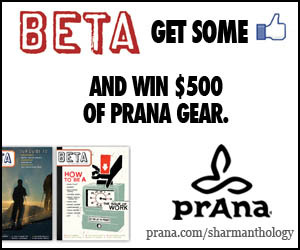 Check out the prAna and BETA “Get Some” Sweepstakes for your chance to win! prAna (which is an ancient Sanskrit word for breath, life and vitality of the spirit) started 17 years ago making clothing for climbing, yoga, and other passions. Both companies are inspired by athletes like climber Chris Sharma. Prize Eligibility – Only persons who are at least 18 years of age can enter.